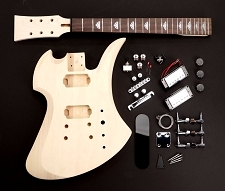 Guitarfetish Guitar kits represent a very cost effective way to build a custom, one of a kind instrument with your very own hands! 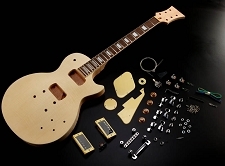 Unlike most kits on the market- we've specified premium wood- featherweight Paulownia, Kiln Dried White Poplar or dense and toneful Basswood. 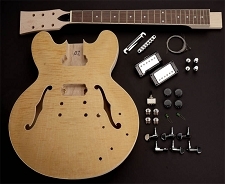 Now- these are "KITS" in the truest sense of the word. You will have to hand-fit necks to bodies, and assume that every part of this adventure will require a moderate level of ability- This is not a jigsaw puzzle that goes together with little or no effort. 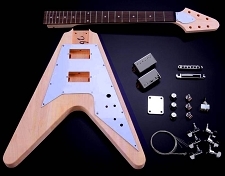 All of the necks- whether bolt-on or setneck sport medium Jumbo nickel silver frets. 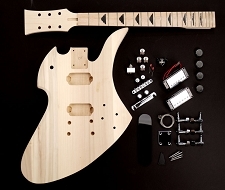 truss rods are pre-installed and the 4.5mm Allen Wrench is included in the kit. 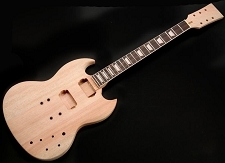 All of the raw wood parts are NOT SEALED- That's right- no epoxy or poly sealer applied at the factory- You are getting pure, raw wood! 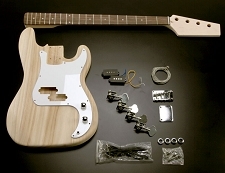 You will need to sand, fill, prime and paint these. 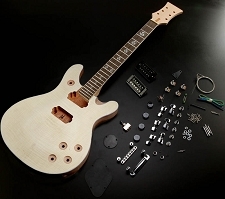 We DO NOT include instructions or an owners manual- We are selling a box full of parts to build a guitar only- There are many, many ways to finish these kits and there are many, many online resources that should be able to assist. 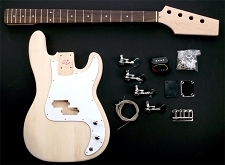 Sorry, we cannot substitute parts on these- You get the bag of "basic" parts as shown, which includes Ceramic magnet pickup, EVERY SINGLE nut, bolt and screw needed for assembly- pickguards, backplates- EVERYTHING. 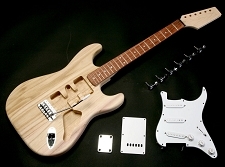 Of course upgrading to our better quality components and critically acclaimed GFS pickups is HIGHLY recommended! 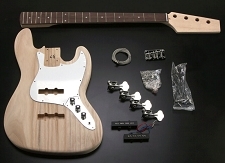 Super Lightweight Strat® Style Kit- Rosewood OR Maple! 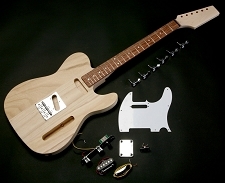 Classic "Mockingbird" Style guitar Kit MAPLE- Poplar body- COMPLETE!